A number of structures can be found in the world of Gaia. These can be visited by your heroes once per day. (Only one visit between all of your heroes, not one per hero.) A visit costs 10 AP, even during Happy Hour. Some of these buildings give a bonus to the visiting hero, some give resources, while others contain creatures that must be defeated for a reward. Note that some buildings have a fame requirement; if you don't have sufficient fame you cannot visit this building. In general this is good, since those with higher fame requirements generally require correspondingly larger armies to enter safely. Any hero visiting these buildings will find themselves welcomed by allies and rewarded for their visit. There is no danger, and hence no experience. The inhabitants of these buildings do not welcome visitors! Any hero coming here had best bring an army, but defeating the foes can lead to rich rewards. 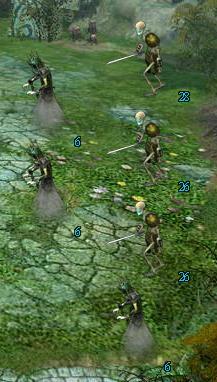 "Undead warriors guard this graveyard, defeat them to claim the riches within!" The simplest of the hostile buildings to defeat without losses, the Tomb contains Skeleton Warriors and Zombies. The reward is some gold (around 1,600) and possibly a low-level item. "A wealth of gold and diamonds lies within this Dwarf stronghold. Defeat the guards to claim this treasure for yourself." While the same troop strength as the Tomb, the missile troops inside mean that visiting is not quite as straightforward. 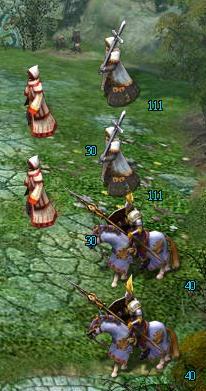 The defenders are Dwarven Warriors and Elven Archers. The reward is a mixture of resources with combined value of around 1,500 gold and the chance of a low-level item. "In this tower Mithlyn's ancient ancestors perfected the dark magic that forever damned their souls and transformed them into deadeyes." While quite challenging, this tower gives good rewards. I've fought sessions with just the liches and ghosts, and others that also had ghost knights. Apart from the gold (2,000 - 2,500) I have always found an item here, which have often been yellow quality. "A stronghold of Bolateni monks, a bounty of supplies is stored within." Just as challenging as the Undead Tower, this is also rewarding. The gold is slightly lower (1,500) but the items are slightly better.